On behalf of Gazelle team, we wish you a wonderful New Year. It is still time to apply for being a monitor at the next European Connectathon. This year, the event will be held at Den Haag (The Netherlands) from April, 16th to April, 20th. You will need an account on Gazelle website to access this form; if you do not have one yet, contact either Hilary or Anne-Gaëlle. The release of Patient Manager (9.8.0) published today and available at https://gazelle.ihe.net/PatientManager now supports FHIR DSTU3 and has been updated to be compliants with the latest version of the PDQm and PIXm supplements. Order Manager 5.0.0 released ! Gazelle team is pleased to announce the release of the Jboss7 version of Order Manager, available from now on at https://gazelle.ihe.net/OrderManager. Please note that the location of the tool has changed and all HL7 and DICOM services are now reachable at IP address: 164.132.1.36. Read more about Order Manager 5.0.0 released ! IHE Academia in the Netherlands organizes an IHE XDS advance training course. We still have some place available in the training so hurry up to register. How to send HL7 messages over TLS using hapi ? I have received this request a couple of time and thus I have decided to post a blog in order to explain how to do it. Hapi provides a test panel app that allows a user to easily use the library in order to send or receive HL7 messages. That GUI provides a check box for using TLS. The IHE ATNA profile requires mutual authentication, this means that the client AND the server need to provide a certificate in order to reach successful TLS negociation. Checking the TLS box does not tell hapi which certificate to use. What most people are forgetting is that they need to configure Java to tell what certificate to use when initiating the TLS communication and what certificate to trust. In order words, the user who would like to use TLS, needs to provide java with the pointer to the truststore (list of certificate to trust) and the pointer to the keystore (certificate to use to initiate TLS). The easiest way to do it without breaking the entire java installation is to provide some arguments to the call to java. 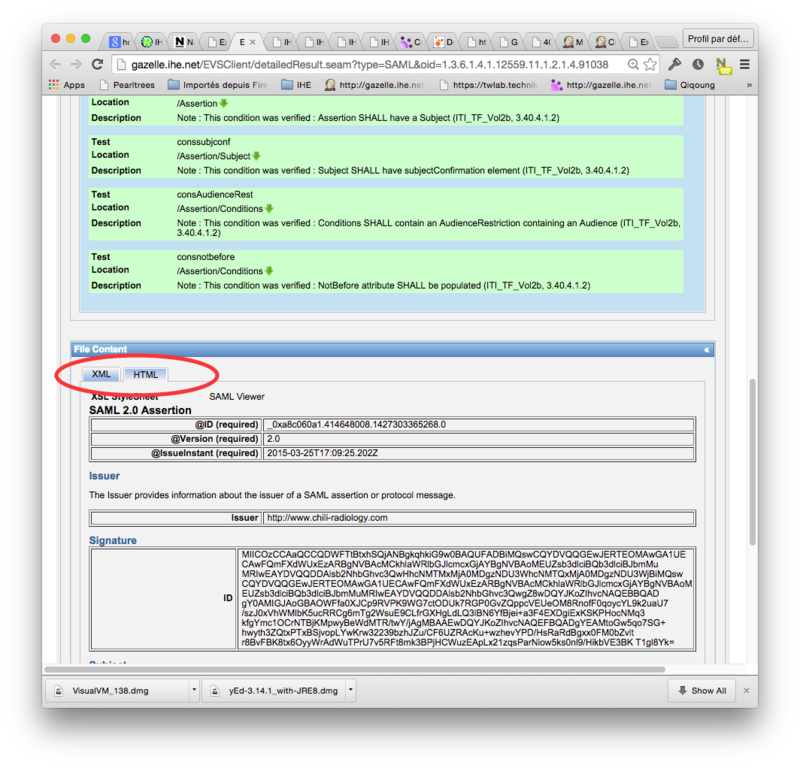 Read more about How to send HL7 messages over TLS using hapi ? The message profiles for validating the messages exchanged in the context of the LAW (Laboratory Analytical Workflow) integration profiles have been updated to match the requirements expressed in the new version of the LAW supplement (1.4), published on March, 16th 2015. 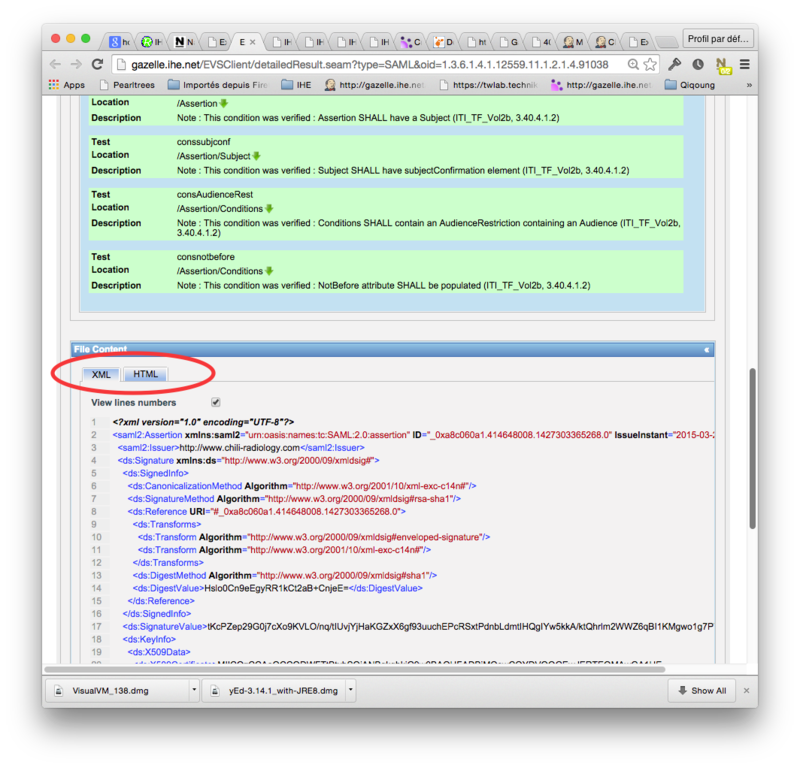 Following the Gazelle ObjectsChecker presentation at IHIC in Pragues in February 2015, we are posting here the JAR file for checking the conformance of a CDA® document to the HL7® CDA® R2 specification. including the jar on a pre-existing java project, and using classes of the tool for validation. We have created this executable, so a user can specify the file to be validated and the CDA® validator to be used. When checking the conformance of messages or content it is quite usefull to have the ability to view the content of the object that is checked. We already add stylesheet to transform CDA and XDW documents into HTML, we have now added this feature to the ATNA Audit Message validation and the SAML Assertion validation section. Patient Manager tool now supports the PIXV3 integration profile. Patient Identity Source, Patient Identifier Cross-Reference Manager and Patient Cross-Reference Consumer actors have involved to now support the transactions defined by this IHE profile. Currently, PIXV3 Manager and Consumer actors only acknowledged the messages sent by your system under test, they are not integrated. This will come in a future release.